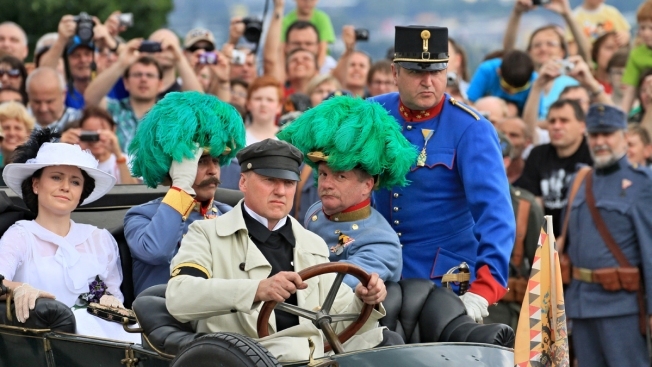 People reconstruct a scene on June 28, 2014 in Brno, Czech Republic of Austrian Archduke Franz Ferdinand (2nd L) and his wife Sophie, Duchess of Hohenberg (L) in a historic Austro Daimler car, a similar type vehicle in which the couple was killed on June 28, 1914 in Sarajevo. Ferdinand's assassination triggered World War I. Artists and diplomats declared a new century of peace and unity in Europe on Saturday in the city where the first two shots of World War I were fired exactly 100 years ago. On June 28, 1914, the Austro-Hungarian crown prince Franz Ferdinand was assassinated in Sarajevo, where he had come to inspect his occupying troops in the empire's eastern province. The shots fired by Serb teenager Gavrilo Princip sparked the Great War, which was followed decades later by a second world conflict. Together the two wars cost some 80 million European their lives, ended four empires — including the Austro-Hungarian — and changed the world forever. Visiting the assassination site Saturday, Sarajevan Davud Bajramovic, 67, said that in order to hold a second of silence for every person killed just during WWI in Europe, "we would have to stand silently for two years." A century later, Sarajevans again crowded the same street along the river where Princip fired his shots. And the Austrians were also back, but this time with music instead of military: The Vienna Philharmonic Orchestra was scheduled to perform works of European composers reflecting the century's catastrophic events and conclude with a symbol of unity in Europe — the joint European hymn, Beethoven's "Ode of Joy." The orchestra wanted to pay tribute to the history of Sarajevo, a place where religions meet, said the first violinist, Clemens Hellberg. Austrian President Heinz Fischer said Europeans "have learnt that no problem can be solved by war." The continent's violent century started in Sarajevo and ended in Sarajevo with the 1992-95 war that took 100,000 Bosnian lives. "If anything good can be found in this repeating evil, it's more wisdom and readiness to build peace and achieve peace after a century of wars," said Bosnia's president, Bakir Izetbegovic. The splurge of centennial concerts, speeches, lectures and exhibitions on Saturday were mostly focused on creating lasting peace and promoting unity in a country that is still struggling with similar divisions as it did 100 years ago. The rift was manifested by the Serbs marking the centennial by themselves in the part of Bosnia they control, where a performance re-enacted the assassination. As Austrian conductor Franz Welser-Moest raised his baton in Sarajevo, an actor playing Gavrilo Princip descending from heaven on angel's wings, raised his pistol in the eastern town of Visegrad, at the border to Serbia, to kill Franz Ferdinand again in a spectacular performance designed for the occasion. For the Serbs, Princip was a hero who saw Bosnia as part of the Serb national territory at a time when the country was part of the Austro-Hungarian Empire. His shots were a chance for them to include Bosnia into the neighboring Serbian kingdom — the same idea that inspired the Serbs in 1992 to fight the decision by Muslim Bosnians and Catholic Croats to declare the former republic of Bosnia independent when Serb-dominated Yugoslavia fell apart. Their desire is still to include the part of Bosnia they control into neighboring Serbia. Serbia itself flirts with both — the EU opposed unification with the Bosnian Serbs and its own EU membership candidacy. Serbian crown prince Aleksandar Karadjordjevic, Serbian prime minister Aleksandar Vucic, President Tomislav Nikolic and the head of the Serbian Orthodox Church, Patriarch Irinej attended the ceremony in Visegrad where Serbian flags flew and the Serbian anthem was played although the town is in Bosnia. Vucic said he was proud because in Visegrad "the Serbs are protecting their good reputation."